Johnson County Living magazine will be published twice per year and distributed all throughout Johnson County. We will produce each edition with exceptional quality and content to become long-lasting, coffee table-quality magazines. If you would like your very own printed copy please visit one of our advertiser locations. Each magazine will be printed on high quality thick paper stock to give it a better feel and increased thickness. The spine of each publication is perfect-bound to resemble a book, and to hold together for many years to come. The covers are UV tinted to withstand exposure and maintain a quality our readers have come to expect. Editions of each publication will be proudly displayed throughout businesses, professional waiting rooms and state legislative offices around the area. Being area-specific, the content within the pages of each publication is sure not to become dated or out of style. Residents from our other areas have stated that each of their editions have become a legacy, holding information about its people and events that one can reflect on and show for years to come. 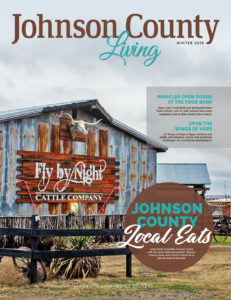 Johnson County Living magazines will also be given out in both newcomer and visitor packets for those moving to and visiting Johnson County. Our goal is to get editions in the hands of all, and not just target some social circles. We’ll be adding an online flipbook edition so you to can have the opportunity to flip through the pages of Johnson’s premier publication. We’ll be adding past and future editions to the website to archive and digitally secure Johnson County Living magazine for future generations to enjoy. We would like to say Thank You for all those who’ll be making Johnson County Living possible. We look forward to bringing you the first, and many more editions for years to come. Please let us know if you have any article suggestions, or have an event you’d like featured in the pages. Please include your contact information, as well as your article submissions contact information. In 2004 the church that sponsored the school dissolved its ties to Holy Cross. The school, originally housed in a chapel on Johnson Avenue, became homeless and had no funding. If they missed a school year parents would have no choice to find another school. Ms. Matejka, at that time a teacher, remembers staff scrambling to find parents to form a board of directors. That summer they spent long hours at board meetings, dreaming up ways to save the school. Crestmont Baptist Church stepped up and allowed them to rent space for the 2004-2005 school year. Matejka recalls hard times and cramped quarters, but this generosity gave them enough time to find a longtime solution in an unlikely source—the old skating rink at the edge of town, on Tarver Road. “We became the proud owners of 1500 pairs of skates, the whole package,” Matejka said. A child-size pair of roller skates sits in her office to remind her of the origin of the school. The last knock on the door looking for the skating rink came in 2014, Matejka said. Parents stepped up, offering to buy materials, offering their trades at cost, to complete the buildout of the school at breakneck speed. Now Holy Cross has added more buildings and grades. The covered arena was busy at Wings of Hope, a therapeutic horseback riding center in Egan. Volunteers stood by with gentle horses, waiting for the next equestrian to get their turn at riding for an hour. There was no rush. Voices were kind and encouraging. It wasn’t just riding lessons….it was much more. 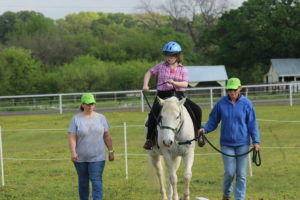 Riders were participating in equine-assisted activities for children and adults with unique physical, mental and emotional challenges. Wings of Hope is a healing sanctuary for many. Allison Gross, Development Director, explained that currently there are 80 riders who come here once a week. They are met by the same volunteer and the same gentle horse at the same time. Consistency is important to their riders, aged 3 to 90 years. Gross knows first hand how equitherapy helps. 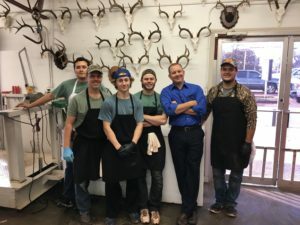 Joshua Deer Processing just celebrated their thirtieth anniversary. The first deer season, they processed 363 animals. Last season, they processed over 4000 in sixteen weeks. Customers bring their game from all over, and some, like their first customer, Monte Byers, have been with them from the very beginning. The business is a success story, but it didn’t come quick or easy. It is truly a labor of love. As their love grew, they wanted children. After several miscarriages, Dana had to quit her job to make that happen. Tim loved processing deer and received his meat cutting certificate from TSTI in Waco in 1982. To supplement their income, Dana’s father, David Russell, gave them his dairy barn and persuaded Tim to remodel it to be suitable for deer processing. All Tim needed was a nudge and a place. Mr. Russell was Tim’s biggest encourager. 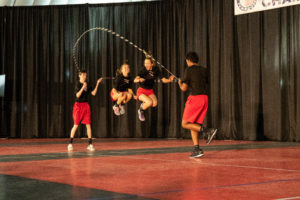 Ask most school-aged children about jump-roping and you’ll probably hear that it’s something they do occasionally in PE or out on the playground. Most adults will tell you that it’s something they were never great at, but once and a while they throw it into their workout routine. But ask any of the folks in Grandview, Texas about jump-roping, and they’re going to tell you about the ZZ Skippers. 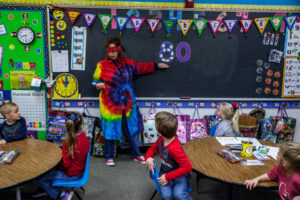 It started twenty-five years ago with the team’s original coach, elementary teacher Trina Griffith, and has been handled with love and devotion over the years after Coach Griffith passed the reins onto others when she retired. Today, one of the coaches is an alum of the ZZ Skippers, happy to pass on what she has learned to the next generation of jumpers. Braukel Bishop, a teacher herself now at the new Grandview school campus, spent eight years as part of the team and now has a son who is starting his first year as a jumper. You see that a lot with the ZZ Skippers. More than one current member of the team had a sister or brother who encouraged them to follow in their footsteps and take over the ropes for them as they moved on from the team.